Are you still accepting Afrikans from throughtout the world who would like to join? When making a reservation, is the $950 deposit per room or per person? Yes. Each traveler secures their registration with a separate $950 deposit. When you call Nana Efia Nsia Mawiya Kambon, she will assist you in any additional questions regarding your costs. Please call Nana Efia Nsia Mawiya Kambon at 919.264.1151 and fill out the registration form. SankofaAbusua@gmail.com Monday-Thursday 10 AM – 7 PM, Friday 10 AM-5 PM Eastern Standard Time. The payment plan is a great way to participate on the Sankofa Journey while spreading out the costs over time. You can choose an automatic draft method which happens on a fixed date every month or login to initiate your payments. With the self-initiated payments you can make payments as frequently as you choose example monthly or weekly until you are all paid up. Just remember to have your final payment in by February 28th. How does pricing work for roommates and children? The cost per person is $3800 based on double occupancy. If a couple adds a child to their room, the child’s fee would be discounted (children over 2 years of age). Remember children from age 2 to 12 pay full fare for ground transportation and receive a discount for air. ( Rooms for children are discounted). The child would have to share the couple’s room for the duration of the journey. The registration payment for all is $950 down per person. $950 deposit holds your spot – not refundable after 60 days. $ 400 March 1 (Final Payment). Total Just $ 3800 from JFK (Flight arrangements came be made from your home city at an additional cost. Booking from your home city allows international flight considerations which includes the additional baggage, no baggage fees and one-touch baggage transfers). If registration begins after October 1, payments would have to follow a modified schedule for the registrant to become up to date. Payment and registration form along with a picture of each registrant should be sent to Sankofa, 2011 Poole Rd, Raleigh, NC 27610. No personal checks accepted. Bank Checks or money orders. If paying by PayPal include the additional fee charged by PayPal. What is the cost for children? Cost for children are $2500 if sharing a room with 2 paid adults. Costs are determined by the number of people in the reservation. Children under 2 are free in a room of two adults. Do I need shots or vaccinations? International Certificate of Vaccination for Yellow Fever is required upon arrival from ALL COUNTRIES if the traveler is more than 1 year of age. Malaria exists throughout the year in all areas including urban areas. Resistance to Chloroquine is confirmed. Further information regarding Yellow Fever Vaccination, may be obtained by calling 1-800-VACCINE or the U.S. Department of Health Center for Disease Control and Prevention’s (CDC) International Traveler’s Hotline at (404) 332-4559 or the CDC Fax Information Service at (888) 232-3299. Information may also be obtained from travel medicine specialists and/or a local or state Department of Health clinic. For all health requirements and recommendations travelers should check with a local Department of Health clinic or U.S Department of Health and Human Services Centers for Disease Control and Prevention (CDC). Further information may be obtained from the CDC Web Site for this Region. Yes. Below are the requirements and process for a “Tourist Visa” in Ghana. From October 23, 2006 the Consulate of Ghana requires all applicants to complete the online visa application at http://www.ghanaembassy.org/ Once the visa application is completed and submitted online, you will be informed your application has been accepted. Please print that page and submit a photocopy to Travel Document Systems along with all other requirements below in order for us to take your documents to the consulate on your behalf. The online visa form must be completed and accepted before sending any documents to TDS. Copy of visa application acceptance form received from New York Consulate. US Homeland Security says you need a passport to travel to Ghana. Where do we get passports? What is our itinerary on the Sankofa Journey? What will the organizers of the Sankofa Journey provide? 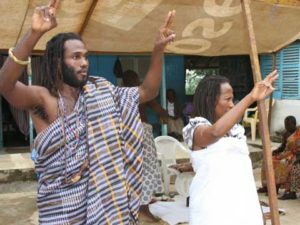 The organizers of the Sankofa Journey will provide expert language instruction in the Akan (Twi) language in context on the ground in Ghana. Additionally, we will take care of all transportation while with the group. We will arrange and pay for 1 meal per day for each participant. We will also arrange and pay for lodging throughout the Sankofa Journey. We will also provide a means for Afrikans to reconnect with Afrika in the most poignant and memorable ways. The Sankofa Journey is truly life-changing. What is not included in this price? This price does not include cost of gift items or other souvenirs, individual excursions apart from the group, extra meals, Hotel costs if you fly in before or stay after the group, Alcoholic Beverages. Ask if there is something specific you have a question about, especially if you think it may be outside the scope of the Sankofa Journey. If I make a deposit and book under one price and later there is a sale, would I be able to get the discounted price? If so, what would I need to do to make that happen? The standard cost of the Sankofa Journey is $ 3199, and this will not fluctuate. No one will get a better or worse price than you. What happens if a reservation is paid for or a deposit is given but the traveler is not able to go? If you discover after March 15th, that you can’t attend the Sankofa Journey your options are that you can tranfer your registration to someone else and they can just pay the transfer fee. Call for details. if you discover before the February 28th deadline that you can’t attend the Sankofa Journey you have a couple of options. You can request a full refund less your deposit. You can tranfer your registration to someone else. Your best option is that can apply your payments to a future year and secure your seat on that Sankofa Journey. Where Afrikans reconnect with our way! Sankofajourney.com is a Kambon Family Afrikan Liberation Site.The Sankɔfa Journey’s sister site is AbibitumiKasa.com. Visit our sister site today for more information on the Twi language of Ghana and more!